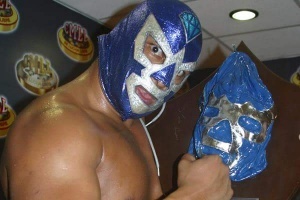 Leyenda de Azul is an annual CMLL tournament to honor the original Blue Demon, similar to the Leyenda de Plata tournament. The Azul tournament is considered a slightly lesser tournament. In recent years, they've try to differentiate the two by having the Azul tournament feature bigger stars, while Plata features better workers. Still, CMLL has been inconsistent about promoting the tournament, seemingly only bringing it back when El Hijo del Santo was unavailable for the Plata tournament, and changing the format in 2005 to accommodate allied promotion New Japan. The winner of the tournament gets a special belt or plaque. The championship is not defended thru the year. The tournament has always been held in Arena Mexico. The 1st Leyenda de Azul was held on October 27th. The match was a 16 man cibernetico, and only the last half of eliminations were shown on television. Leaving Blue Panther as the winner. leaving Tarzan Boy as the winner. 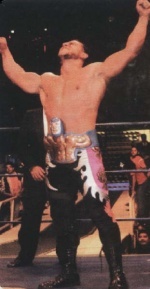 leaving Universo 2000 as the champion, his first major victory after losing his mask, beating the man who took his mask in the process. The 4th Leyenda de Azul was held on July 15th, as a 16 man one night tournament. In addition, the winner would be considered CMLL World G1 Heavyweight Champion and earn a spot on a following New Japan tour. It is believed New Japan decided the winner of the event instead of CMLL, to choose who'd come on tour with them. The 5th Leyenda de Azul was held on November 4th, as a 16 man one night tournament. The Leyenda de Azul returned in on December 12, 2008. The Cibernetico format returned as well. 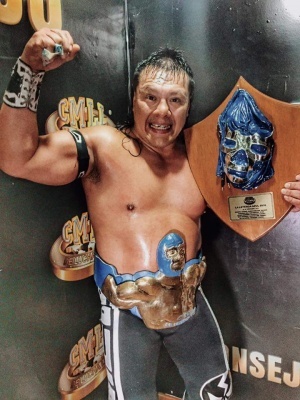 Terrible was the winner, with some help from his Los Hijos del Averno friends Ephesto and Texano Jr..
Lizmark Jr. was announced for the tournament, but was replaced by Villano V.
The Leyenda de Azul took place on July 29 in Arena Mexico. Again, it was a cibernetico. Mr. Niebla won clean. Niebla was handed the trophy by Alejandro Munoz, Blue Demon's biological son. The 2012 Leyenda de Azul took place on October 12 in Arena Mexico. Mr. Niebla was scheduled to participate, but was replaced by Volador Jr.. Tama Tonga made his CMLL debut in the match. 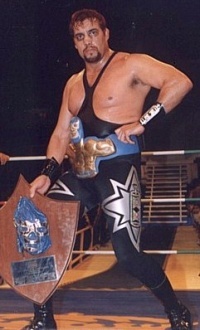 Diamante Azul won the trophy. The 2014 Leyenda de Azul took place on June 20 in Arena Mexico. A battle royal determined the sides for the cibernetico. All times from the television version, which included some editing. The 2016 Leyenda de Azul took place on November 18 in Arena Mexico. The 2017 Leyenda de Azul took place on December 22 in Arena Mexico. This page was last edited on 1 January 2018, at 13:04.